Physics Buzz: The Beauty of the Sea Butterfly's "Flight"
Flight has evolved independently at least three times, by three different animal groups: birds, bats, and insects. Now, a team of researchers at Georgia Tech has confirmed that a species of aquatic snail, the "sea butterfly" Limacina helicina, flaps its wing-like appendages the same way that some small insects use their wings to fly. “In a remarkable example of convergent evolution, we show that the zooplanktonic sea butterfly Limacina helicina ‘flies’ underwater in the same way that very small insects fly in the air,” they write in the Dec. 8, 2015, issue of the Journal of Experimental Biology. Insects diverged from gastropods, such as snails and slugs, approximately 550 million years ago. 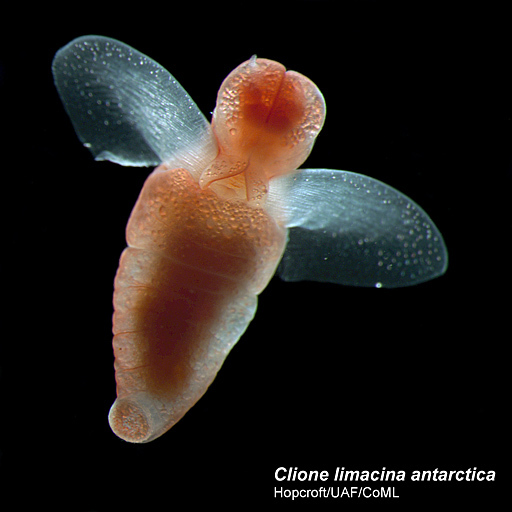 The motion that L. helicina (and likely some shell-less marine mollusks like Clione limacina and Clione antarctica) shares with small flying insects is the Weis-Fogh or “clap-and-fling” mechanism. This involves a wing stroke that moves in a “figure-of-eight pattern to produce lift, and both generate extra lift by peeling their wings apart at the beginning of the power stroke,” the Journal of Experimental Biology article says. 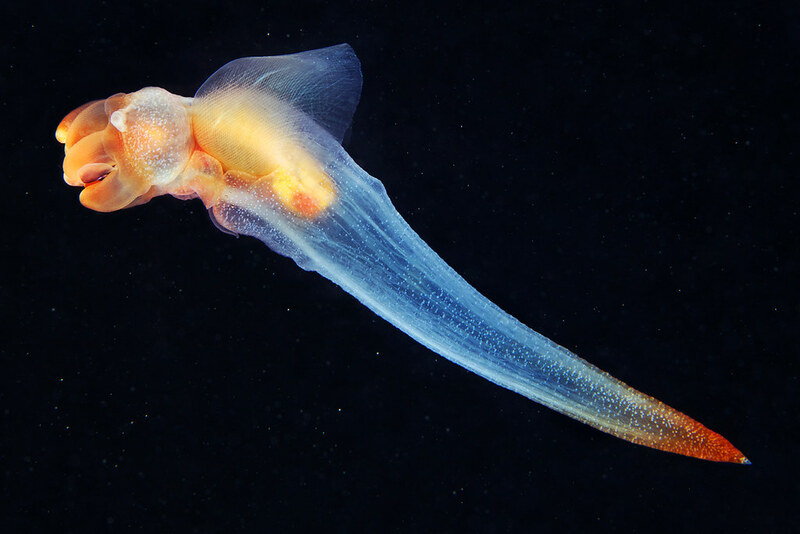 This is unlike most zooplankton, which use their appendages as paddles in a more traditional swimming motion. Despite being fundamentally different, the environments of small flying insects and L. helicina have similar fluid-motion dynamics. One measure of the fluid-motion dynamics in a substrate is the Reynolds number—the higher the Reynolds number, the more turbulent the environment. These air-flying insects and sea-swimming mollusks (in the case of Limacina helicina, polar and subpolar waters) inhabit environments with a low to intermediate Reynolds number, allowing them to use the clap-and-fling mechanism without their "wings" suffering serious wear and tear. Experimental measurements of the dynamics of the clap-and-fling mechanism have been difficult because of the tiny dimensions of the flying insects that regularly use it. But the larger sizes and lower “wing” beat frequencies of L. helicina has aided the study of fluid-dynamics and the Weis-Fogh mechanism. But there is a difference between the figure-of-eight wing stroke of L. helicina and that of small flying insects and even the shell-less Clione limacina and Clione antarctica. During the sea butterfly's wing stroke it rotates its body in such an extreme way (angles from 50 to 60 degrees) that the Georgia Tech team calls it “hyper-pitching.” The structural properties of L. helicina’s round shell facilitate the animal's hyper-pitching. Although it does not use a figure-of-eight wing stroke, a similar body angle swing is seen among some butterfly species. It's believed that, like its terrestrial namesake, the sea butterfly's erratic body motion during flight may be used to avoid predators. L. helicina's hyper-pitching may also have positive implications for miniature unmanned aerial vehicles. Pitching typically causes loss of flight stability and control, but hyper-pitching could provide aerodynamic benefits to such micro-drones.